For this special New Year episode, Gastropod transports you to Oaxaca, Mexico, for the legendary Night of the Radishes, celebrated the night before Christmas eve, where locals present their most elaborate and inventive radish carvings. You’ll also get a taste of entomophagy, otherwise known as the practice of eating bugs, when Cynthia and her partner Tim try chapulines, or grasshoppers, for the first time. 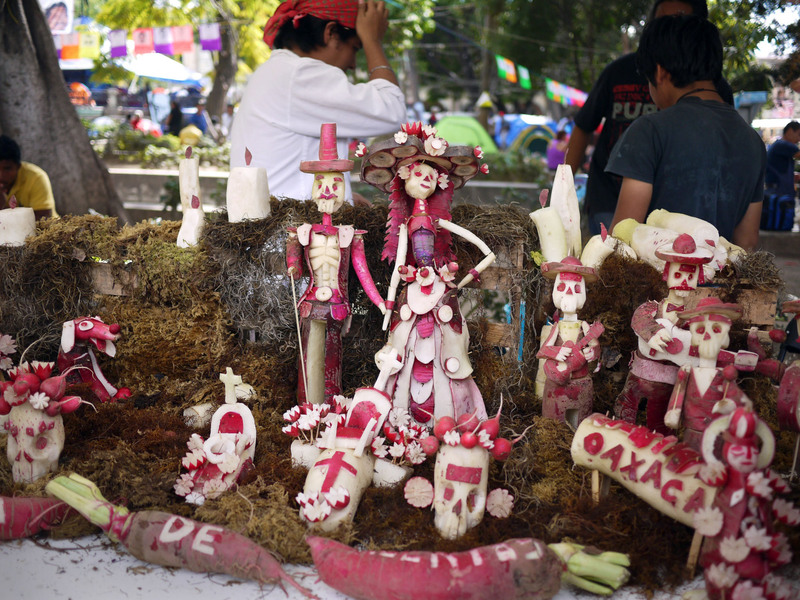 The Night of the Radishes has taken place in the central square, or zocalo, of Oaxaca on December 23, every year for the past 117 years, since 1897. 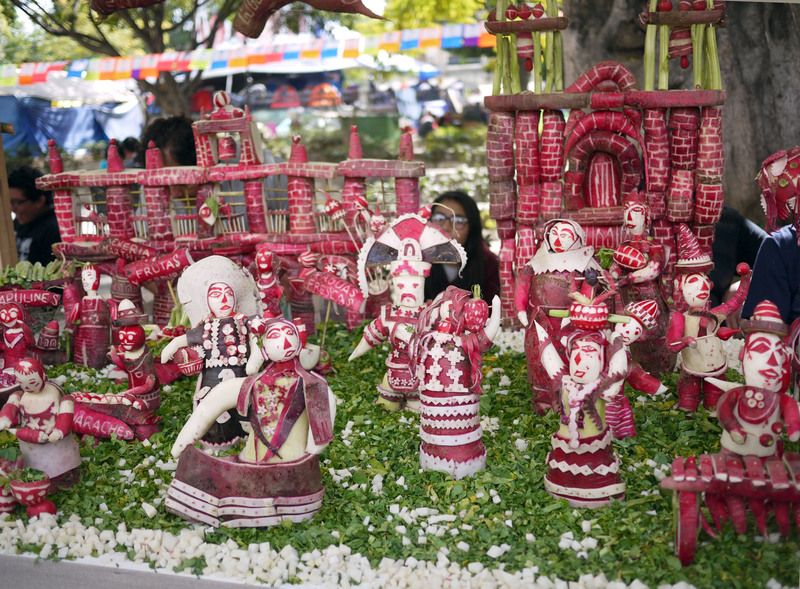 Originally intended as a way to decorate produce stands and attract Christmas shoppers, the festival now attracts more than 100 participants, and thousands of tourists and locals alike wait for more than 4 hours for a glimpse at the carved scenes. Here are some of the photos Cynthia took as she wandered around the zocalo. All radish photographs by Cynthia Graber. The image above is Mezcal Man. 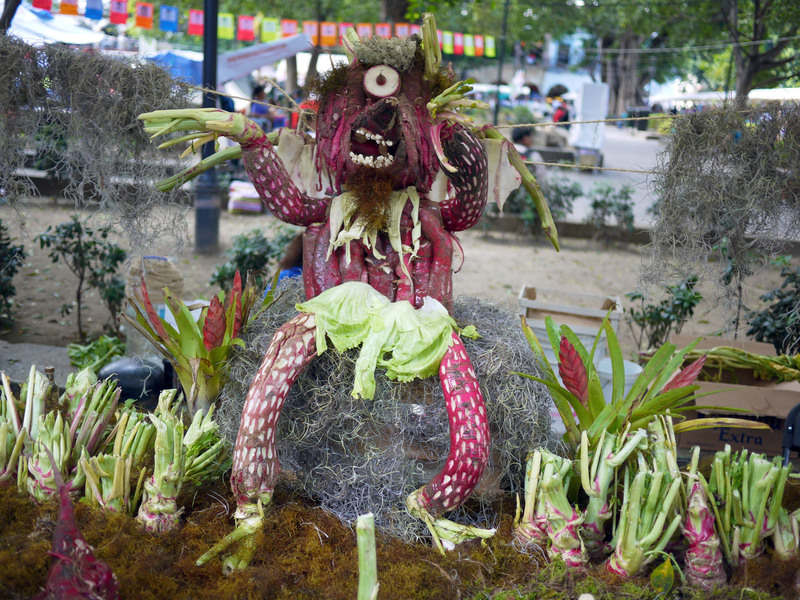 Fruit and vegetable carving as a way to attract custom is a time-honored tradition that is still alive and well in Mexico's markets. 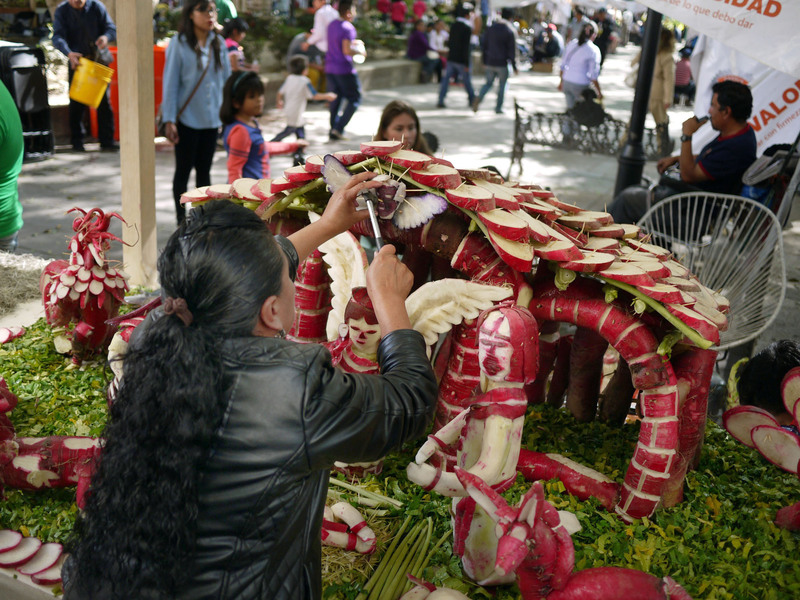 As Nicky mentioned, vendors at Mexico City's La Central de Abasto, the largest wholesale market in the world, spend hours carving watermelon and mamey into pyramids, rosettes, and even monstrous mouths. 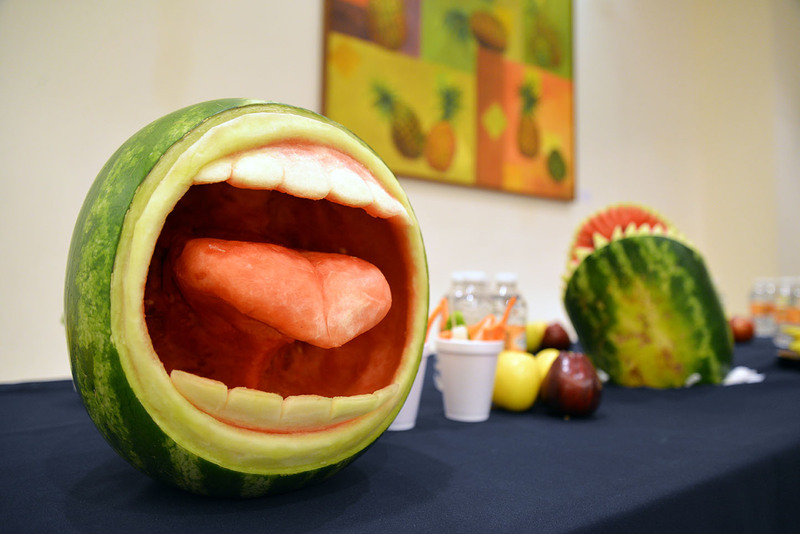 Carved watermelon on display at La Central de Abasto's in-house art gallery. 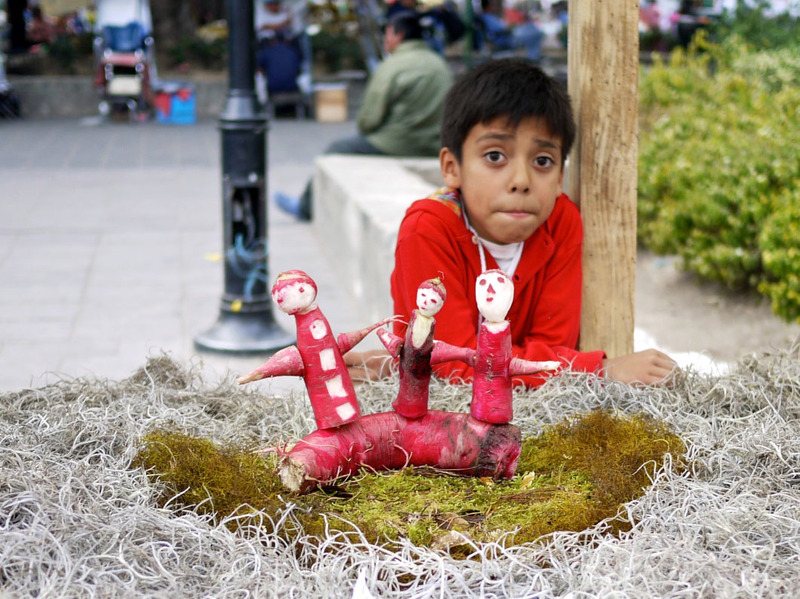 Photographed by Nicola Twilley during her two-week residency at the market with the Laboratorio Para La Ciudad. 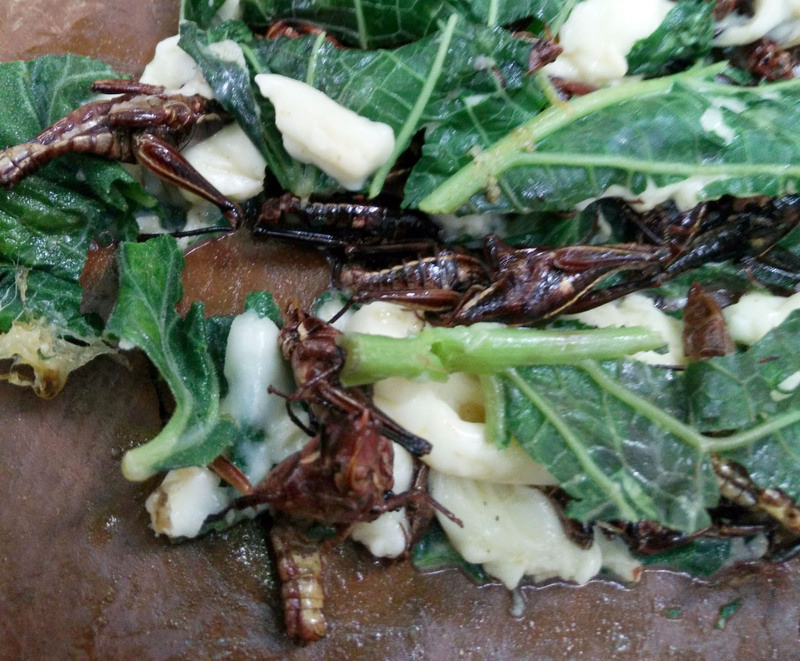 While the radishes are inedible, insects are very definitely on the menu in Oaxaca. In the episode, we discuss some of the benefits of entomophagy: in a 2013 paper, the Food & Agriculture Organization of the United Nations argued that the "mini-livestock" contain high-quality protein, amino acids, and omega-3 fatty acids, and require about a quarter of the feed to yield the same amount of "meat" as beef, as well as much less water. Insects also create significantly less pollution than cattle, sheep, or chickens, and need a smaller amount of land for cultivation. The problem, of course, is that to many Western eyes, insects are disgusting. For Cynthia and Tim's first insect-eating experience, they made sure to try a dish that paired the bugs with two of Cynthia's favorite Oaxacan products: hierba santa, a slightly anise-flavored leaf, and a thick layer of a melted Oaxacan cheese called quesillo. Thanks to Rubén Vasconcelos Beltrán, the chronicler of the city of Oaxaca, for sparing a few minutes the same day his children returned from Mexico City for the Christmas holiday. He also copied a chapter of a book called Noche de Rábanos: tradiciones navideñas de Oaxaca (Night of the Radishes, Oaxacan Christmas Traditions), by Alejandro Méndez Aquino, which was hard to find in the U.S. And, if you want to learn more about how farmers produce such over-sized radishes, read Nicky's piece on breeding and growing giant vegetables. If you have questions about this episode—or want some food recommendations in Oaxaca! —ask us either by leaving a comment here or via email. Cynthia has plenty of restaurant recommendations for what she considers one of the most delicious cities she's ever visited, even if you're planning on steering clear of grasshoppers yourself!